I’m not… I’m not a Marvel fanboy, as it were. Admittedly, I own more Marvel comics than anything else. I have more access to Marvel comics than anything else. But I am not a card-carryin’, DC-hatin’, Marvel fanboy. So you can imagine, after the first four weeks of the revised “Stew’s Reviews” and realizing I had done two Marvel books, two non-Big-Two books, and zero DC books, I was beginning to worry that the image of bias was sneaking in. And I didn’t want that because, like I said, I’m not someone who by-and-large prefers Marvel to DC. I tend to like both a great deal. The way I view them is that Marvel seems to be more consistently in the range of 7/8 out of 10 as a company. They don’t always knock it out of the park, but their lows are still generally enjoyable enough that I don’t mind having read them. DC is more of a hit-or-miss. I’d say with DC, I’m more likely to get something that’s either in the 9/10 out of 10 or the 2/3 out of 10 range. The things about DC that I like, I LOVE. But the things they do that I don’t care about tend to bring me down. So it’s give-and-take. Whatever will today’s offering be? Writer and Artist: Just… so many. Not to diminish the artists’ efforts on this title—there is no bad art in the series—but the writing core is Mark Waid, Geoff Johns, Grant Morrison, Keith Giffin, and Greg Rucka. That’s an All-Star team of comic scribes. Publisher: DC. Hey! That’s 2-1-2 so far. Protagonists: Whoof, I’m already regretting this. Let’s do a quick rundown of some of the major ones: Animal Man, Adam Strange, Starfire, The Question, Renee Montoya, Ralph Dibney, Batwoman, Steel, Will Magnus, Booster Gold, and it just goes on. Antagonists: Various. To say too much might be spoilery, given that some characters switch roles as the series goes on. This story, guys. THIS STORY. Let’s get the publishing gimmick out of the way first: 52 was released as 52 weekly issues over the course of one year as a way of filling in a time gap that DC had left in the wake of Infinite Crisis. Fun fact: I don’t think I have ever read Infinite Crisis. I mean, I may have? When it came out? And it was one of those 2-3/10’s I was talking about up there? But I don’t really recall it at all. Was it the one where Batman shoots Darkseid with a gun? No wait, that was… the other one. Maybe? Conversely, I’ve read 52 approximately all the times ever. And I’ll read it again and again until I die. It’s that good. Even with a quintet of writers at work, for this book to have been a weekly title and be as high of quality as it is simply astounds me. I can barely write one comic review in a week. With 52 issues, there is a lot in play here, and one of the absolute strengths of this series is the it focuses on so many of the great DC players that lack the star power of your Batman or Superman or Wonder Woman or Flash or Green Lantern. It’s not to say these characters don’t appear, but they are background characters for the most part while the spotlight finds others. There are over a half dozen coinciding major storylines, and they dwell on the adventures of the likes of Booster Gold and The Question and Steel, giving life to the men and women of the DC Universe that spend most of their existence toiling in one level of obscurity or another. With 52, DC shows just how strong and deep their roster is. These stories occasionally intersect to small degrees, but it’s not one of those “all roads lead to one destination” tales, and you can decide for yourself if that is for better or worse. What I mean here is that while Ralph Dibney and Booster Gold briefly cross paths in their two separate stories, and the stories of Will Magnus and Black Adam build to one shared point, neither really has much to do with Renee Montoya’s or Animal Man’s arcs. You might personally prefer that all these threads coalesce into one arching event that bridges everything in the series, but it’s not something that really felt like a sticking point with me. Not everything needs a pretty bow to tie it all together; sometimes things happen inside a vacuum, but that doesn’t make them any less meaningful. Picking a story or two from 52 as my favorite would be like saying “I have six children, but I’d really like to just tell you about two of them”. They are all so engaging and fulfilling in their own rights. That said, the two arcs focusing on Booster Gold and Supernova and on Renee Montoya and The Question are perhaps the creme of the series. Booster’s perpetual screw-up-itude is on full display in 52, as he’s trying to position himself as the new face of Metropolis in a seemingly post-Superman world. He wants to be a hero, but more importantly, he wants to be VIEWED (and compensated) as a hero. He’s outed for setting up crimes for him to thwart right at the same time that another hero, Supernova, emerges and steals all his thunder. Booster is so delightfully flawed in this storyline; he is genuinely hard to root for even as he is the protagonist of his arc. Elsewhere, Renee Montoya is seeing her life collapse around her in a haze of alcohol and meaningless hook-ups when the enigmatic The Question seeks out her assistance. 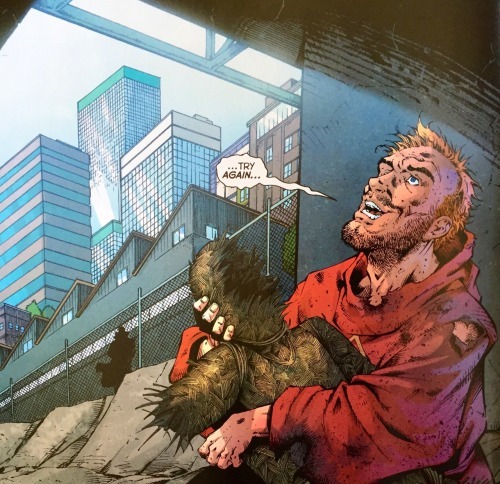 As the the two dig into a criminal undertaking in Gotham, they find a trail that leads them to the foreign country Kahndaq, the mystical city Nanda Parbat, and—for Renee—deep within herself. The relationship between the brooding and bitter Montoya and the jovial and mysterious Question is a joy, and honestly? I’d have read 52 issues of just the two of them. The worst thing about the conclusion of their arc is that I want so much more of their interaction. Wait, I can’t do it. I have to focus briefly on at least one more of 52’s core stories, and that is Ralph Dibney’s quest to return his murdered wife to life. Whereas Ralph doesn’t start 52 off quite in the gutter in which Renee Montoya finds herself, he crashes through it and bottoms out even further than she had as the story marches forward. The former Elongated Man’s abject desperation is hard to read at points, and the culmination of his tale is not for the faint of heart. Talking Point: I love the roster of this series. Given that, if you could pick any… five relatively underappreciated characters and create a book starring them, who would they be? 52 is an absolute top 5 comic book story of all time for me, and honestly? Probably my second favorite of all time. I know fellow Ghost Chad doesn’t get my love for it, but I don’t even care. It’s not a series that has the rep of the likes of Watchmen or The Dark Knight Returns, but it’s such a quality character-driven story that makes so many of DC’s also-rans into characters you’ll love. I adore it. If you haven’t read it before, you need to. If you have, do yourself a favor and read it again.